* Eliminate the on-board DIP switch, manual set-up for DIP switch is no longer needed. * This also makes much easier & very simple to use for end users. * Plug-and-play reduces the learning curve and save your precious time. * It is True/Real USB data transmission protocol (USB-USB), Not via Fake/Pseudo-USB data communication. * Fake/Pseudo USB data transfer needs the middle serial or parallel port conversion: USB-Serial-USB conversion or LPT-USB conversion, this limits the programming speed significantly. 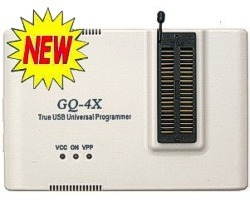 * GQ-4X features the same revolutionary data interface as GQ-3X, the True USB data transmission with PC/LapTop. * Connects PC via high-speed USB link, provides the fastest possible data transfer rates for programming/reading data from target IC's. * Assembly language written programming algorithms run fast and reliable. Not affected by the PC speed changes and Windows 0/S variations. * Packaging supported: TSOP48 (16bit & 8 bit), TSOP32, PSOP44, DIP8 to DIP40, PLCC, SOP,SOIC, MCS-51+, PLCC84, and etc.